We began our first step of the Lewis and Clark journey just before leaving the St Louis area. We visited the Louis and Clark interpretative center along the banks of the Missouri River. This location is very close to where the actual first encampment was placed. The exact location is not known for sure. Over the years, the river has shifted many times and the camp lies somewhere beneath those waters. Currently there is no plans to locate the exact site. There are a few outside exhibits that represent period structures including the fort the expedition would have used. It was recently damaged in a strong storm. The center provides a real look at how the expedition prepared for this dangerous journey. It was very well done and we started our journey north and west with a better understanding of what preparations were made to succeed. Our last stop here was to visit the burial site of William Clark, co-commander of the expedition. Many of his descendants have also contributed to their country. Many are also buried here near the family patriarch. Our guide mentioned that there are currently 17 family members who have “reservations” to be buried on the plot. We arrived back home a few days ago after a great trip. 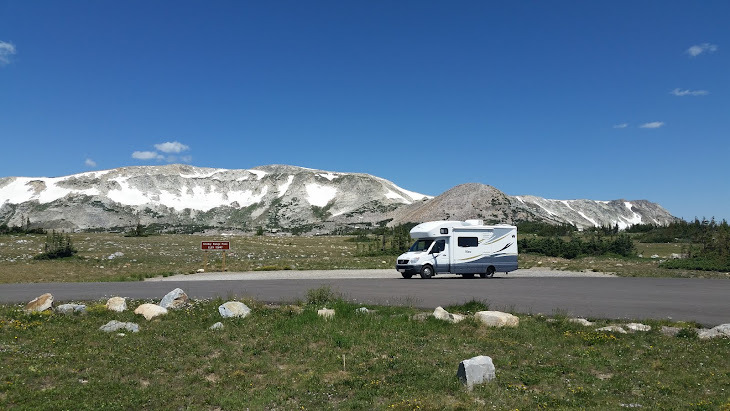 The main focus of the trip was the Lewis and Clark caravan with 22 motorhomes, traveling the entire route that Lewis and Clark followed on their epic exploration of the west directed by President Jefferson. After that, we explored more of the west to see places that have been on our bucket list for quite awhile. In total, the trip lasted 73 days. We covered 8, 250 miles and visited 20 states. I am very happy to say that the motorhome performed well, with no problems. I plan to post on those parts of the trip I have not covered while on the road. Today was a short travel day, as we stopped in Hot Springs to tour the National Park and the bathhouses. I admit to not knowing any of the history of the town and the federal involvement from the very beginning. I found the way this city developed to be rather unique. A long version can be read here. The short version is that the Federal Government got involved early to protect the springs by claiming the area and created the Hot Springs Reservation in 1832. It remains under federal control today as a National Park. We toured the Visitor Center, which was the Fordyce bathhouse and is in the middle of bathhouse row. There are 23 restored rooms as they would have been during the heyday period. It was a very interesting tour. There is at least one bathhouse that still provides spa services. Others are now used for different purposes. We stopped for the night at Lake Chicot State Park, near Lake Village, AR. The lake is the largest Oxbow lake in North America. We had a full hookup site on the water. The park is very quiet as the season ends on July 4th, as it is too hot this time of year. I understand that, on our arrival the temperature was 97.